During these recent times of economic downfall and financial mess,the general consensus has been for Britain to laugh their way out of depression. Well,thanks to two fantastic men called Charlie Talbot and Dunstan Kornicki we can continue to do so as they bring their hit Edinburgh Finge show 'Blow Up! 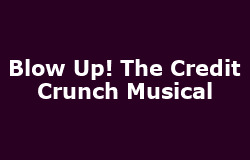 The Credit Crunch Musical' to London from this October. The hilarious comedy musicals told through the eyes of former financier Max Klein, who explains how banks and hedge funds made their millions then left the rest of the world to their financial doom. It is backed by the greatly named Oompah Brass Band who play hit songs from artists including AC/DC, Dolly Parton, Kylie & Queen to help explain the whole sorry mess. It was a complete hit at the Fringe with the Guardian saying: "If this is the Credit Crunch can we have one every year", so you'd be a fool to miss it. A fool. The show will play on six consecutive Sundays from October 25th - November 29th at London's Leicester Square Theatre and tickets are a very pocket-friendly (those guys) £17.50/ £15 (concession) or £12.50 for groups of eight or more, so with all that leaning in it's favour, what's stopping you? Check the "Tickets" links below to bring yourself closer to a seat of wonderment. New London dates have been added at the King's Head Theatre in Islington, twice-weekly between Wednesday 14th Oct 2009 and Saturday 28th Nov 2009.